Problems may not be obvious. Have a good look under panels and furnishings. 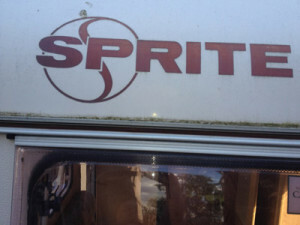 Ebay is full of second caravans at this time of year. Some are bargains – others are damp boxes with wheels about to lose their integrity at the first sharp bend. Have a look at this checklist, if you find one or two issues you can always barter down the price, given the work or costs involved to put right. Always think safety first, then the cost of the repairs. If it too much to fix, be prepared to walk away. Which is why you always need to visit and check what you are about to spend your money on. Be prepared to spend more than you think on repairs though. This is the killer of caravans. The main framework inside a caravan is relatively thin 3×2″ wooden struts. If this has started to rot, you can often write off the caravan as a no hoper, unless you are prepared to do a lot of work rebuilding the frame. You can buy a damp tester for about £30 and it will be a great investment in the long run. Look for water ingress, damp smells or rotten panelling. Use your nail to push into the panelling; if it feels soft and spongey it is an indication that there may be a leak. 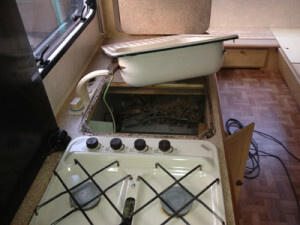 Most leaks happen at the joints between the sides of the caravan and roof. The aluminium rail which runs along the edges of most older caravans has a mastic (SikaFlex) join behind which can rot and pull out. To make sure your van is fully watertight, this should be stripped, cleaned and reapplied very few years. By the way this in itself is a long job! Check the axles to make sure that they are aligned and not out of shape. Wobbly wheels are a very expensive fix as most caravans are made on AlKo trailer frames. If you visit their site, you can get costs of replacement parts. Gas powers the cooker, the heating and the fridge. Get these properly checked by a qualified engineer before you use. Yellow in the flames indicates deadly carbon monoxide. Also make sure it is fitted with a gas and carbon monoxide alarm. Check the tyres for wear and pressure. Most caravans have been standing around all year with their tyres rotting. Check for cracks in the walls of the tyres, and replace if necessary. Have a qualified electrician check the plugs and wiring, you never know, a mouse might have been lunching on some of the flex hidden in the walls. Leisure batteries used in caravans are more expensive than your normal car batteries at around £70 for a replacement. If they are fully discharged they are ruined and might as well be tipped. Check that the battery is well maintained, and take a voltmeter to check that it is not dead. If possible it should be in a battery box and tied down securely. Accept that the pump, pipes and toilet will need really good cleaning. Check the pump works by asking to run some water through (don’t run the pump dry). Pumps can be expensive to fix – £35 for a new external pump like a Whale, or up to £75 for an internal replacement. Check the water heater works, if it is gas it will also need an engineer to certify that it is safe. Electric heaters are cheaper at about £200 to replace. Gas ones are far more expensive. Most caravan fridges have a selector so you can choose how to power them. They will run off mains electricity, the battery/car or gas. Again it will need testing to make sure it is safe. A new one will set you back around £700, but you can buy a new small mains only electrical fridge for around £75, if you need to swap an old and broken one out. The deal breaker will be the surroundings. Be prepared to recover all the existing chintzy furnishings, rip out carpets and replace with new cool looking fabrics. 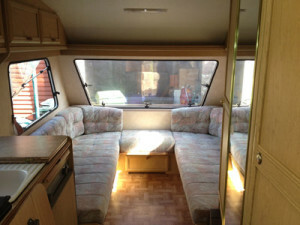 Even for a modest sized caravan, this could set you back £300. Make sure you haggle down. You will always find faults that the eBay seller doesn’t want you to know about. So make sure you go with your research about what the cost of some basic repairs will be. • Does your driving license allow towing? • Check the route – any low or narrow bridges? For your first time avoid any difficult roads. • Check the brake lights, indicators and running lights. They all need to be working before you pull off. • Check the connection to the tow hook is solid. • Wind up any wheels / stands and make sure the jockey wheel has been unscrewed and pulled up to its highest amount. • Turn off any gas and disconnect the supplies from the bottles. Also close any switches or gas selectors. • If you have things in the van, put most of the weight slightly forward of the axle. Don’t have anything that is heavy high up as it will make the caravan unstable. • Check your mirrors and move off slowly. • Don’t accelerate, turn or brake suddenly. Your driving needs to be smooth, so look well ahead for potential issues and anticipate well in advance. • Bear in mind your car will not stop quickly, nor will it handle the same. Act like a truck. Stay in the left hand lane and only overtake when you really need to. • Don’t ever go in the outside lane on a motorway – that’s against the law too. • As you are now a truck, flash to let other trucks in and respond to trucks flashing you in with a waggle of the indicators in thanks. Enjoy your new purchase and keep on trucking!